The true story of Viv Nicholson's 1961 win on the football pools and her life immediately thereafter has proved a seam of rich material over the years. Her exuberant pledge to "spend, spend, spend!" went on to be the title of her 1975 autobiography, which in turn was transformed into a BAFTA winning BBC Play For Today (remember those?) by Jack Rosenthal, though it was not to be until 1998 that her saga received the full-blown musical treatment from Steve Brown and Justin Greene. Nicholson's win, equivalent to £2 million in today's money, was a lifechanger and set her on a path to extravagance, numerous husbands, addictions and ultimately bankruptcy. Rarely has a modern day fable proved so literally fabulous, with Nicholson's tale having much to say about how whether happiness and fulfilment can actually be bought for cash. And whilst the Union's production would benefit from a bigger spend itself, once again Sasha Regan uses the venue's bare walls and pillars to her advantage. Under Christian Durham’s direction not only does the space serve the more intimate and tender moments well, but equally allows the brash, ballsy and gloriously British tone of the piece to thrive. Elle-Rose Hughes simple yet effective set consists of a painted wall adorned with newspaper cuttings. Such staged austerity demands much from the cast and the company of Spend Spend Spend deliver energy from the outset. Ensemble numbers such as the brilliantly period-defining ‘John Collier’, along with ‘One In A Million’ and the act one closer's title number are sizzlingly sung by the 15 strong troupe, balancing a raucous verve with musical precision under the skilled musical direction of Inga Davis-Rutter. 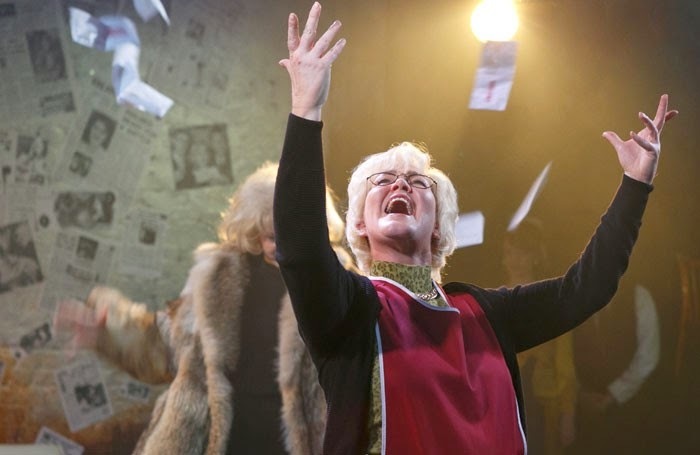 The leading role of Nicholson is shared by Katy Dean and Julie Armstrong as Viv young and old respectively, who prove the powerhouse of the piece. An infectious pair, particularly as they duet with in ‘Whose gonna love me’. Armstrong’s Viv is full of heart as her character re-lives the memory of the money-made roller coaster, even when watching scenes play out from the side lines. Armstrong maintains a nostalgic glint in her eye that gives her performance an immense warmth throughout. That said, it is Dean who is the driving force of both plot and pace, particularly in the number ‘Sexual Happening’. With such a reflective story there could always be a risk of a slide into monotony but Dean allays these fears, delivering feisty from the off. Notwithstanding a rich musicality, the occasional flaw (such as some lyrics being repeated too frequently) can pull the pace back. Nonetheless the show remains a defiantly British musical that offers a great night of entertainment and theatre and at £20 a pop there's certainly no need for the audience to Spend Spend Spend.